Holiday Treats and Beverage Offerings at The Universal Orlando Resort! The holiday season is upon us! This season is filled with decorating, celebrations, parties and of course… FOOD! 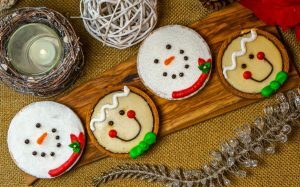 Food plays a big role in many of our holiday celebrations and festivities! What better way to rejoice in this wonderful season than spend time with those you love and enjoying some of your favorite treats! You get the picture! 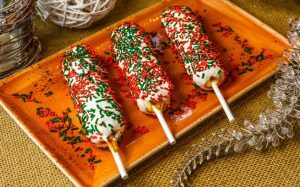 Holiday foods and goodies are an iconic part of our holiday season and Universal Orlando Resort has you covered! 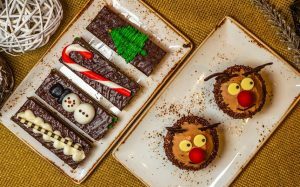 Let’s take a look at the festive food and beverage offerings now available for the holiday season at Universal Orlando! These items can be enjoyed now through January 6, 2019! 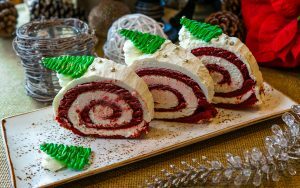 A popular holiday treat this year is the Red Velvet Yule Log. The red velvet adds a fresh twist on this holiday classic! You can find this treat in Universal’s Islands of Adventure at Croissant Moon Bakery. 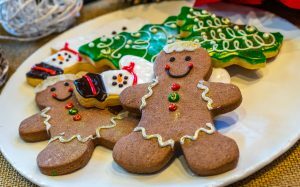 You can also find this festive favorite in Universal Studios Florida at Beverly Hills Boulangerie and San Francisco Pastry Company. For many apple strudel hot from the oven is a holiday staple! 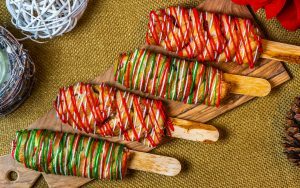 Universal has put a spin on this holiday classic by putting it on a stick and adding a drizzle of frosting! Be sure to try this treat for yourself in Universal’s Islands of Adventure at Croissant Moon Bakery. You can also find it in Universal Studios at Beverly Hills Boulangerie and San Francisco Pastry Company. Additional treats include reindeer cupcakes, waffles on a stick, cheesecakes, ribbon pastries and an array of classic sugar cookies! All of these goodies can be found at multiple locations throughout the parks! 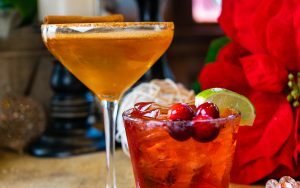 With all these amazing holiday treats, you are going to want a festive beverage to wash it all down! Here are some of the new holiday drinks that have premiered this year. First up we have the Cranberry Margarita. This holiday margarita can be found at Finnegan’s Bar & Grill in Universal Studios and at Mythos over at Islands of Adventure. Ingredients: Tequila, orange liqueur, lime juice and cranberry juice shaken and served on the rocks. Garnish with a lime wedge, fresh cranberries and a sugar/salt rim. Next up is the Pumpkintini! This fun pumpkin martini can be found at Mythos in Islands of Adventures. Ingredients: Dark rum, orange liqueur, apple cider and pumpkin puree garnished with a cinnamon sugar rim. Another favorite, the Apple Cider Irish Mule! This can be found at Lombard’s Seafood Restaurant in Universal Studios. 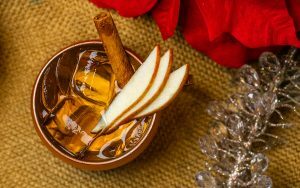 Ingredients: Irish whiskey stirred with apple cider, topped with ginger beer and a cinnamon stick and apple slices for garnish. You can also find a Harvest Margarita with great pumpkin and apple flavors when visiting Confisco Grille! Find an Apple Pie on the Rocks – a blend of vanilla vodka, apple juice and cinnamon at Finnegan’s. Discover the Jack Frost with vodka, prosecco mixed with lemonade and a sugar rim over at Lombard’s and Confisco Grille. Universal also has some festive non-alcoholic drinks. 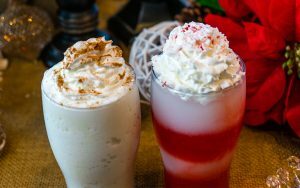 Guests can enjoy the Candy Cane and Eggnog frozen beverages, hot cider or hot chocolate! These beverages are all served park-wide at all the food & drink carts. There are so many delicious treats to discover this season at the Universal Orlando Resort! Contact your Kingdom Magic Vacations Travel Planner to plan your next visit! 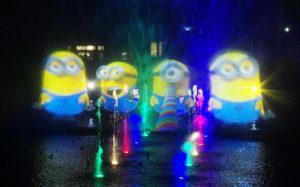 This entry was posted in Dining, Universal Orlando Resort, Universal Studios Orlando, Wizarding World of Harry Potter and tagged christmas, holiday treats, orlando, Universal, Universal Orlando, universal studios on December 13, 2018 by Megan Przychodzien. As Halloween approaches, several creatures of the night are getting a series of treats from a team of medical experts at Disney’s Animal Kingdom. Around this time each year, veterinary care specialists conduct annual wellness checks on a roost of endangered bats as part of Disney’s commitment to excellent animal care. The bats, known as Malayan flying foxes, receive complete physical examinations, including blood analysis, vaccination and dental cleaning in front of thousands of Guests who view the procedures from a large, on-stage window into a state-of-the art veterinary hospital. With a wingspan close to six feet, the Malayan flying fox is one of the largest bats in the world and can be seen on exhibit along the Maharajah Jungle Trek in the Asia section of the theme park. Malayan flying foxes are mammals that eat and rest in trees and roost at dawn. As fruit-eating animals, bats assist in pollination and seed dispersal for a great variety of plants that are useful for lumber, food, medicine and other products. Bats are also helpful around the neighborhood where they eat mosquitoes and other bugs. In addition to receiving annual exams, the male bats at Disney’s Animal Kingdom voluntarily cooperate in their own medical care, making veterinary treatment much easier and safer. Through training, bats willingly allow themselves to be weighed, spread their wings for inspection, or open their mouths for dental evaluations. The intent is to help the animals become comfortable with husbandry practices that help monitor their well-being. Flying foxes have long, sharp, curved claws on their toes, which allow them to hang effortlessly upside-down in trees. The skin between the fingers is smooth and strong while the rest of the bat’s body is covered with soft fur. As the name suggests, the head resembles that of a small fox because of the small ears, long snout and large eyes. Unlike most other warm-blooded animals, bats maintain a warm body temperature only when active. While sleeping during the day, their body temperature drops to the temperature of the air around them. In warmer temperatures, bats cool themselves by fanning their wings, licking their chest and wings, and by panting. When flying, legs work in unison with the wings, somewhat like swimming through the air. Bats are the only mammals that fly. Other mammals may glide through the air, but bats flap their wings and fly. The life span of a bat is about 20 years. Females of a colony give birth during a specific season, although the peak varies geographically. Most births occur in May and June. Gestation takes about 180 days, and usually a single pup of around 133 grams is born. Twins are rare. The young nurse for two to three months. The mothers carry their young for the first few days; then, the bats are left in the roost tree while the mothers forage for food. Sexual maturity is attained in 18-24 months. For the first few days, the mothers carry their young while they forage for food. Soon, though, the young bats are left behind during these hunts for food. This entry was posted in Animal Kingdom and tagged Animal Kingdom, animal programs, asia section, bats, blood analysis, care specialists, creatures of the night, disney, eco system, flying foxes, food medicine, Halloween, husbandry practices, maharajah jungle trek, malayan flying fox, male bats, orlando, park guests, physical examinations, seed dispersal, stetter, veterinary care, veterinary hospital, veterinary treatment, wellness checks on October 28, 2011 by Rick Howard. 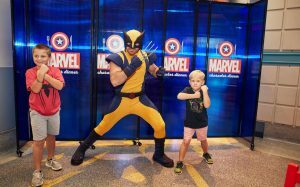 Steve Gonsalves and Dave Tango, stars of the hit Syfy Channel series, “Ghost Hunters,” were hosted by Universal Orlando Resort to experience its annual Halloween Horror Nights event. While visiting, the duo encountered the cursed souls within The Forsaken, one of eight haunted houses featured at this year’s event. One of the top-rated reality shows on Syfy Channel, “Ghost Hunters” features Gonsalves, Tango and a group of real-life paranormal researchers as they investigate haunted places across the nation. Named “the country’s best Halloween event” for four years in a row, Universal Orlando’s Halloween Horror Nights brings to life guests’ most intense nightmares on select nights this fall through October 31. Click Here to Book your Universal Vacation Now! This entry was posted in Universal Orlando Resort and tagged ghost hunters, Halloween, halloween event, halloween horror nights, haunted houses, nightmares, october 31, orlando, paranormal researchers, steve gonsalves, tango, Universal, universal orlando resort, universal vacation on October 21, 2011 by Rick Howard. There’s no better place to enjoy the Holidays with your family this year than at Universal Orlando Resort. 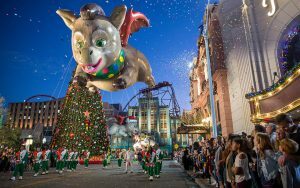 It’s the only place you can come face-to-face with The Grinch and the Whos from Whoville, watch a cheerful holiday parade filled with big, colorful Macy’s balloons and sing along to the classic sounds of the season as you stroll through a holiday-trimmed theme park with your loved ones. The Holidays fanfare runs from December 3, 2011 through January 1, 2012, offering guests incredible entertainment themed for the season at both Universal Studios Florida and Universal’s Islands of Adventure. At Islands of Adventure, adults and children alike will be entertained when the popular Dr. Seuss book “How the Grinch Stole Christmas” is brought to life in Grinchmas. Guests can see the live stage show featuring The Grinch and the Whos from Whoville with an original recorded musical score by Mannheim Steamroller. Guests will also have the opportunity to meet The Grinch and the Whos, and on select dates, purchase a spot at a special character breakfast with the mean, green one himself. 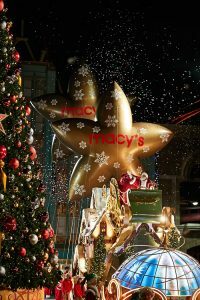 At Universal Studios, the Macy’s Holiday Parade will celebrate its 10th Anniversary of partnership with Universal Orlando by filling the streets every evening with some of the same iconic elements seen winding through New York City each year at the Macy’s Thanksgiving Day Parade. 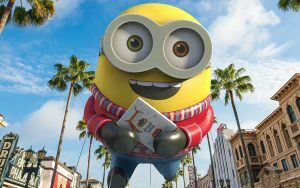 The beloved event features colorful holiday characters, fantasy-filled floats – including one specially-designed to commemorate the 10-year milestone – a tree-lighting ceremony by Santa Claus and dozens of larger-than-life balloons. 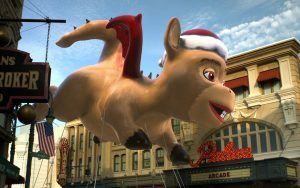 The Macy’s Holiday Parade also welcomes select park guests to participate in the procession as real balloon-handlers guiding the helium giants, a truly unique and exclusive experience to Universal Orlando. Returning this year with more concerts than ever before is Mannheim Steamroller – the masters of Christmas music with more than 40 million albums sold worldwide. 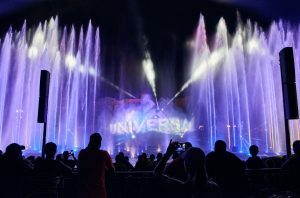 The acclaimed musical group will take to the Music Plaza stage in Universal Studios six times this year to play their memorable holiday hits for guests, performing on December 3, 4, 10, 11, 17 and 18. 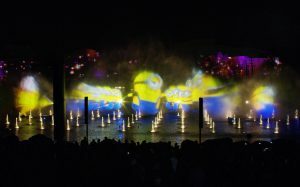 Also at Universal Studios, guests can enjoy special holiday-themed versions of their favorite shows, and nightly a capella holiday music in the nearby Holiday Village, which is filled with hand-blown glass ornaments, caramel apples, hot chocolate, roasted chestnuts and a cupcake decorating location. 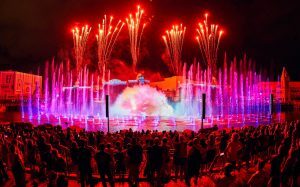 The celebration continues at Universal Orlando’s three on-site hotels – Loews Portofino Bay Hotel, Hard Rock Hotel and Loews Royal Pacific Resort – all of which will glisten with holiday decorations. 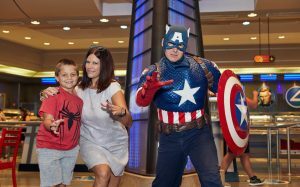 Hotel guests will be immersed in the spirit of the season with tree-lighting ceremonies, special musical performances, holiday pool-side “dive-in” movie presentations and holiday buffets and dining events. Loews Portofino Bay Hotel kicks off the season on Friday, November 25 with ‘Holiday Harbor Nights’, a wine tasting, food and jazz celebration on the piazza, along with a tree lighting ceremony. Hard Rock Hotel welcomes Santa to The Kitchen restaurant on Fridays in December and Loews Royal Pacific Resort rings in the new year with a family-friendly dinner and celebration. 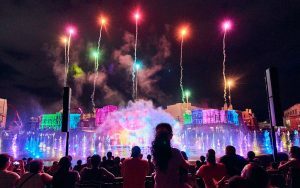 All holiday entertainment – including the Mannheim Steamroller concerts – is included as part of two-park or multi-day admission to Universal Studios and Islands of Adventure. There’s never been a better time to start a new family tradition at Universal Orlando’s Holidays event! This entry was posted in Universal Orlando Resort and tagged character breakfast, christmas music, colorful holiday, dr seuss book, grinch stole christmas, holiday characters, holiday parade, how the grinch, islands of adventure, live stage, macy s thanksgiving day parade, mannheim steamroller, musical score, orlando, park guests, sounds of the season, th anniversary, thanksgiving day parade, tree lighting ceremony, Universal Orlando, universal orlando resort, universal studios florida on October 20, 2011 by Rick Howard. C ruella de Vil, meet the apprentice sorcerers! And you, too, Scar. And, for that matter, a legion of other Disney villains! Armed with what appear to be nothing more potent than cards, guests engage with villains at special locations throughout the park. But the fact is: The cards have magic powers players can use in their quest to defeat the villains. This entry was posted in Magic Kingdom and tagged apprentice, baddies, cards, disney, disney imagineering, Disney vacation, disney villains, magic kingdom, magic powers, merlin the magician, missions, orlando, premieres, ruella, scar, sorcerers, Sorcerers of the Magic Kingdom on October 14, 2011 by Rick Howard. Singer Gloria Estefan at Halloween Horror Nights XXI at Universal Orlando Resort. 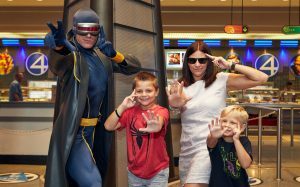 This entry was posted in Universal Orlando Resort and tagged blends, gloria estefan, Halloween, halloween horror nights, orlando, universal orlando resort on October 13, 2011 by Rick Howard. Dee Snider, legendary rocker, entertainer and front man for Twisted Sister came face-to-face with three savage, blood-thirsty banshees at Halloween Horror Nights at Universal Orlando Resort. This entry was posted in Universal Orlando Resort and tagged banshees, dee snider, dee snyder, front man, Halloween, halloween horror nights, halloween horror nights at universal orlando, orlando, twisted sister, universal orlando resort on October 11, 2011 by Rick Howard. Look! Dumbo is Going the Wrong Way! Actually, Dumbo is just reversing decades of flying in counter-clockwise circles. Call it “unwinding,” if you will. And in a new location within Magic Kingdom. Guests will board Dumbo the Flying Elephant from the lovable critter’s left side — like mounting a horse … and unlike the way guests hop aboard for a whirl at Disney parks on three continents. It is scheduled to begin happening in early 2012 when select experiences in the Storybook Circus neighborhood of New Fantasyland debut just northeast of Mad Tea Party. Also early 2012, the existing Dumbo attraction near Prince Charming Regal Carrousel will close, be refurbished and be moved to a location in Storybook Circus next to the new Dumbo attraction. The result when completed later in 2012: double Dumbos, one going this-a-way, one going that-a-way … a real circus act, if you will. There also will be a “big top” that serves as a queue area for the popular attraction. It will feature a variety of interactive experiences currently being developed. Two other Storybook Circus elements planned for opening early in the year are The Barnstormer and Fantasyland Station. Guests who enjoyed The Barnstormer at Goofy’s Wiseacre Farm will be happy to know the junior coaster thrills of that attraction are back with a thematic change: Goofy has sold the farm and is now a circus stunt pilot and magician, The Great Goofini. The completely re-imagined train station will serve as the gateway to Storybook Circus and all Fantasyland points beyond. This entry was posted in Magic Kingdom and tagged barnstormer, carrousel, circus act, disney, disney parks, dumbo the flying elephant, fantasyland expansion, going the wrong way, interactive experiences, junior coaster, mad tea party, magic kingdom, magician, new location, orlando, queue area, real circus, stunt pilot, thematic change, three continents, train station, vacation, Walt Disney World, whirl, wiseacre on October 10, 2011 by Rick Howard. A step into Harmony Barber Shop is a step back in time. Hair tonics and talcum powders line the dark burgundy shelves. The Dapper Dans barbershop quartet strolls by daily, singing melodious tunes in perfect harmony and entertaining guests with their humorous banter. Although small and quaint, Harmony Barber Shop performs between 350 and 400 services a week. Haircuts for children age 12 and under are priced at just $15. Another popular treatment for kids as well as kids-at-heart is colored hair gel, which costs $7.50. Of course there are also services for grown-ups to enjoy. An adult haircut costs $19. Beard and mustache trims are $5. “First Haircuts” is the establishment’s specialty. Young Walt Disney World guests who receive their first haircut at the Magic Kingdom barbershop are treated to many delightful surprises, from “pixie dust” and bubbles to Mickey Mouse stickers, and an extra-special “My 1st Haircut” set of Mouse Ears and certificate. The “My 1st Haircut” special is priced at $18. This entry was posted in Magic Kingdom and tagged barber shop, barbershop quartet, barbershop quartets, colored hair, dark burgundy, delightful surprises, hair gel, hair tonics, Harmony Barber Shop, magic kingdom, melodious tunes, Mickey Mouse, mouse ears, mouse stickers, orlando, perfect harmony, pixie dust, simpler time, step back in time, talcum powders, time hair, Walt Disney World on October 7, 2011 by Rick Howard. An all-new dining experience hosted by a Disney animal specialist is available at Sanaa at Kidani Village, located in Disney’s Animal Kingdom Lodge at Walt Disney World Resort. Over lunch, an animal expert reveals facts and myths about wildlife as guests immerse themselves in the culture and flavors of Africa. There’s no more perfect setting, as Sanaa’s windows frame grazing zebra and giraffes, Ankole Cattle and White-Bearded Wildebeest. The experience accommodates up to 12 guests, offering an intimate, fun insider’s view, with plenty of time for questions. Adding flavor to the experience: a four-course, African-inspired lunch made in Sanaa’s tandoor ovens. It boasts many delicacies, such as warm naan bread, savory dips, slow-cooked meats, unusual sweets and more. After dessert, diners venture to a savanna lookout, to observe and learn more about the exotic animals grazing the landscape. The Animal Specialist experience takes place every Wednesday from 11:30 a.m.-1:15 p.m. Cost is $49, $29 ages 3 to 9 (special kid’s menu). 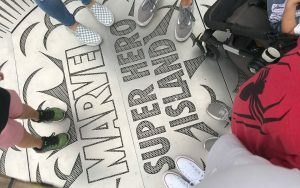 The price includes the gratuity plus a $5 contribution to Disney’s Worldwide Conservation Fund. Reservations can be made up to 180 days prior to the experience. This entry was posted in Disney Restaurants and tagged animal expert, Animal Kingdom Lodge, ankole cattle, conservation fund, cooked meats, delicacies, disney, disney animal, disney world resort, exotic animals, flavors, gratuity, naan bread, orlando, sanaa, specialist experience, tandoor ovens, walt disney, Walt Disney World, Walt Disney World Resort, wildebeest, worldwide conservation on October 5, 2011 by Rick Howard. 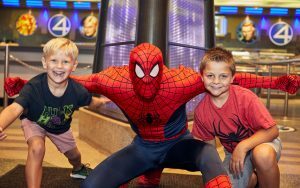 There will be celebrities, Disney characters and a musical fanfare when the PGA TOUR “goes to Disney World” for the season-ending Children’s Miracle Network Hospitals Classic Oct. 20-23, 2011. There’s also likely to be some drama: The $4.7 million golf tournament Oct. 20-23 on Disney’s Magnolia and Palm courses will determine the final TOUR money rankings and which players have full exemptions in 2012. Retired Tampa Bay Bucs linebacker Derrick Brooks is the first celebrity announced as an amateur participating in the golf Classic during the first and second rounds, played as a pro-am. Nine-time All-Pro Brooks’ National Football League career included 11 Pro Bowl appearances and selection as Associated Press Defensive Player of the Year in 2002, when the Bucs won the Super Bowl. A tradition of the Classic during the 1970s, 1980s and 1990s is returning in 2011: A cadre of characters and the red-and-white-clad Walt Disney World Band will gather at the 18th green to celebrate the tournament winner. That was the case in 2010 when Robert Garrigus came from behind on Sunday to claim his first PGA TOUR win. He became the 17th player to notch his first TOUR victory on Disney’s historic courses, which have hosted the Classic since 1971. A field of 128 professionals will tee off in the quest for the $846,000 winner’s check. After two rounds, the field will be trimmed to the low 70 scores for the weekend rounds. A one-day grounds ticket is $10; the weekly tournament badge providing admission to the grounds Oct. 17-Oct. 23 is $20. Parking is free and youth ages 17 and under are free when accompanying a paying adult. This entry was posted in Disney Golf and tagged bowl appearances, defensive player of the year, derrick brooks, disney, disney characters, Disney Golf, disney music, Golf, league career, linebacker derrick brooks, miracle network, national football league, network hospitals, orlando, Orlando Golf, pga, pga tour, pro bowl, robert garrigus, second rounds, tampa bay bucs, tour money, tour victory, tournament chairman, tournament winner, Walt Disney World on October 4, 2011 by Rick Howard. 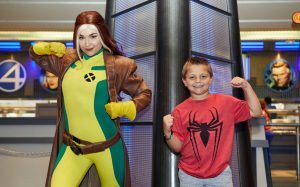 For a limited time, guests can purchase 4-night/5-day Magic Your Way room and ticket packages at select Walt Disney World Resort hotels for select dates and enjoy a Dining Plan at no additional charge. The window to book arrangements is now through Oct. 29, 2011. 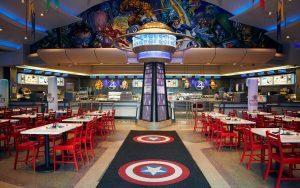 Free Quick Service Dining Plan at a select Disney Value Resort. Free Disney Dining Plan at select Disney Moderate, Deluxe and Deluxe Villa Resorts. The arrival dates for the offer (based on availability) are: Oct. 1-Oct. 6, 2011; Oct. 22-Nov. 3, 2011; Nov. 12-17, 2011; Nov. 26-Dec. 1, 2011; Dec. 10-15, 2011; Jan. 8-12, 2012; Jan. 21-Feb. 2, 2012; Feb. 11-16, 2012; March 3-8, 2012; and March 24-29, 2012. Important Details: No group rates or other discounts apply. Excludes suites and campsites. Advance reservations required. 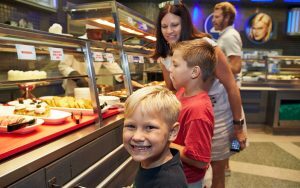 With the Disney Dining Plan, children ages 3-9 must choose from children’s menu if available. Excludes gratuities and alcoholic beverages. Some table service restaurants may have limited or no availability at time of package purchase. This entry was posted in Disney Discounts and tagged advance reservations, alcoholic beverages, campsites, deluxe villa, Disney Dining Plan, Disney vacation, disney world resort, feb 2, Free Disney, Free Disney Dining Plan, gratuities, group rates, jan 21, limited time, orlando, select magic, service restaurants, ticket packages, time guests, walt disney, Walt Disney World, Walt Disney World Resort, walt disney world resort hotels on October 3, 2011 by Rick Howard.